the 13.6% national proportion of population in eight of the ten largest metropolitan areas, with blacks making up 32.4% of metro Atlanta’s residents, 25.8% of metro DC, and 21.0% of metro Miami. Clearly, blacks have left a significant imprint on America’s cities. Don’t get me wrong. There are plenty of black elected officials who represent cities and advocate for policies and strategies that will improve them. There are plenty of black activists who passionately speak on matters such as crime, poverty, income inequality, affordable housing, and other special interests that are often perceived as strictly urban issues. And there are many black entrepreneurs who grew up in cities and make an effort to incorporate some semblance of urban policy into their corporate work. But there is a dire lack of a black voice and perspective in the traditional channels of urbanist dialogue. When I think of urbanists, I think of two distinct groups of people. The first group consists of intellectual types who are mostly interested in developing ideas to improve the urban form. They often have rather abstract views of cities, and focus on design as the key mover of an improved urban form. They are big proponents of things like walkability, transit use, denser development, and the like. The second group is often less intellectually-oriented in their approach, but has a laser focus on a special interest they advocate. This group is made up of bike advocates, transit supporters, urban agriculture activists, and other urban special interests. They are also big proponents of walkability, transit use, and denser development, but they strongly feel that getting there means increased bike usage along dedicated bike networks, or heavy- and light-rail transit, or converting vacant land to agricultural use. In either case, the groups are almost exclusively white. This has implications on general public views about cities. As mentioned by Aaron Renn (the Urbanophile) nearly three years ago in an article he wrote for New Geography entitled “The White City,” the cities that many hold up as exemplary models for urban development have very few black residents. The usual suspects for progressive cities, like Portland, Seattle, Minneapolis, Austin and Denver, not only have small African American populations, but have not been burdened by racial tensions in the way that so many other American cities have. About three years ago the website Planetizen developed a list of the top 100 urban thinkers. All the names were nominated and voted on by website visitors. Unsurprisingly, there is not a single African American on the list (from my recollection there are only about five that are under the age of 50, but that’s for another discussion). Surely there is some insight that some blacks have gained through our urban experience that would get us considered for this list. Why has that not happened? Is there a black Jane Jacobs? Is there a black Andres Duany? Lewis Mumford? Edmund Bacon? William Whyte? Richard Florida? James Howard Kunstler? If not, why not? Admittedly, most of the top urban thinkers come from the fields that, you know, deal with the urban form, and there has long been a lack of black participation among those disciplines. Urbanists tend to be academics, writers and journalists, architects and designers, and of course planners (although it’s been my experience that there are fewer planners who are passionate about cities than one might think). Particularly in the case of academics, architects and planners, urbanists tend to come from highly educated professions, and there simply aren’t high numbers of blacks in those fields. While they might not be considered urbanists in the thinker/intellectual sense, there are high-profile blacks who work to improve the urban form. Mitchell Silver, chief planning officer for the City of Raleigh, North Carolina, is President of the American Planning Association. He’s been in a position to utilize his several years of experience working in New York City to make some positive changes in Raleigh. And there’s Toni Griffin, professor of architecture at the City College of New York, former director of community development for the City of Newark, New Jersey, and private practitioner who has conducted high-profile planning work in Newark and Detroit. Admittedly, the reason that I know of them is because I’ve had the opportunity to (briefly) work directly with them through the course of my career; there could be many others who are just as accomplished that I’ve never heard of. Simply by Googling “black urbanist”, I came across Kristin Jeffers, a recent graduate of the University of North Carolina-Greensboro with an MPA in Community and Economic Development who blogs at theblackurbanist.com. She’s been doing the blogging for more than a year and I applaud her for her passion and her efforts. However, it’s a bit much to expect her to have much prominence so early in her career. The almost pervasive opinion for decades that “urban = bad”. This opinion is one that has plagued American cities forever, but gained steam after World War II. Our cities were seen to be filled with “slums” and “ghettos”, and while there were many places that were in poor condition, there were places that were vibrant, dynamic and very livable. 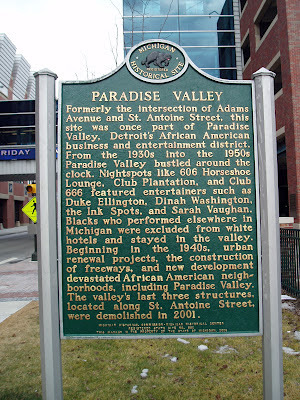 These markers are for Paradise Valley in Detroit, and Indiana Avenue in Indianapolis. 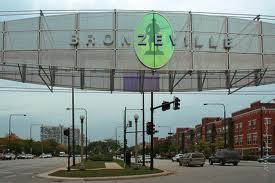 Both were vibrant neighborhoods that were devastated by freeway construction and urban renewal in the 1950s and ‘60s. Now all that remains are signs of their earlier vitality. This same tragedy occurred throughout the country. The impact of white flight. It seems there is general acknowledgement about the economic impact of white flight but little recognition of the social impact. 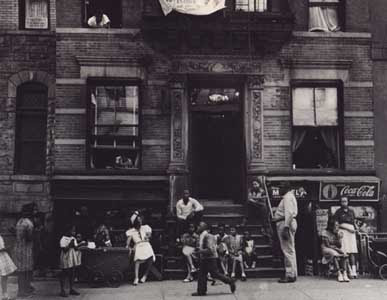 One often overlooked impact is that many intact city neighborhoods, with longstanding histories, transitioned so quickly and completely from white to black that there was no effective transfer of neighborhood knowledge that would provide a foundation for new black residents. When white residents left they not only relocated their homes and businesses, but their institutions and social networks. Struggling new black residents were often unable to bridge that gap. Gentrification and the new notion that “new urban = white”. I mentioned earlier that one group of urbanist is the type that advocates and supports things like transit, biking, mixed-use development, open space and trail networks, and other amenities that can make urban life more vibrant. Unfortunately many of these amenities have developed a “white” identity in the minds of many blacks, often being identified as the “things white people like” in their cities. You’ll often hear of this from community activist types whose major thrust has been to focus on the crime and poverty issues that plague so many of our urban neighborhoods, and simply see bikes/transit/parks/mixed-use as the tools that will be used to displace them. A FUBU (for us, by us) mentality put forth in urban neighborhoods, when collaboration is key to community revitalization. 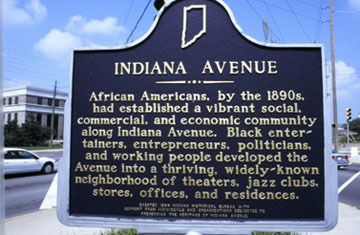 Related to the above point, there is huge desire by many community activist types to revitalize neighborhoods on strictly African American terms. Improve conditions, they say, and the black middle class will jump at the chance to move back to the community they grew up in. There is quite a bit of truth to that, but in most cities the black middle class is not large enough to support the revitalization of entire sections of cities. Activists will have to realize that revitalization will happen only when you include groups beyond your own. If there’s going to be real and long-lasting revitalization in America’s heavily black urban neighborhoods, the elected officials and community activists who represent them are going to have to shift their priorities. They will have to let go of their visions of neighborhood past and start thinking of a new community paradigm – one that may not be exclusively African American. They must move away from the debilitating notion that they want enough of the new amenities to serve the needs of current residents, but no so much that they are eventually displaced. They must join hands with the numerous groups that are engaged in improving cities, recognize them as allies and stop thinking of them as the urban enemy. If our communities are to be saved our leaders must embrace new thinking around cities. This post originally appeared in Corner Side Yard on May 21, 2012. For many social, political, legal, and financial reasons this is almost impossible in the U.S. At best 15 to 20 percent of housing can be made ‘affordable’ without underminining gentrification efforts. Most american blacks want nothing to do with such areas when they establish the ability to own property. They understandably feel insecure about their relativley recent achievement of their financial position and are unwilling to take the risks normally involved in rehab efforts. When I lived in D.C., I knew many middle-class blacks who claimed to love the District and triple parked their cars with Maryland licenses in front of the many historic churches they attended on Sunday morning. They claimed to be outraged at the moving in of many professional class whites in areas of the District. The minute I suggested they buy in these areas as I did, they began listing a hundred different rationalizations for why they couldn’t. Until there are a number of blacks able to own property and willing to do so in these areas, they won’t benefit or be a meaningful part of urban development. We have no right to try and make them feel guilty about it either. It’s their life and their money. They have to do what they think is best for them. Good article. But I’m a little confused, because I’m not sure if this is call to arms or just stating the fact that there aren’t any “black urbanists.” Perhaps setting a standard or a call for people who may want to become a “black urbanist” and guiding them might get a solution to the problem that you so accurately describe. I am a black urbanist, and there have always been black urbanists. And I’m glad to see the issue raised and hopefully it can spark debate and interest from the broader urban planning/design community. There was a good discussion on Melissa Harris Perry Show on MSNBC about “urban” America a little while ago. – Blacks associate urban areas with negative characteristics that they had to deal with just a generation ago. Unlike whites, they have not yet experienced first-hand the negative characteristics of suburban areas. – Black men walking around in a city will be presumed by many to be criminals and treated accordingly; when driving around the suburbs that is less likely.